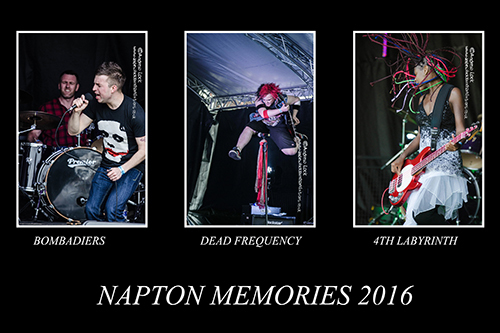 The Napton Festival always one of my highlights of the local live music calendar returns to its now long standing home on the grounds of the Village Hall on Friday 7th and Saturday 8th July. Once again the event will raise funds for The Napton Music Festival Trust which supports the local live music scene as well as various charities. This year they have a bit of a theme going on with cover bands making up a large percentage of the acts but I am sure there will be a dose of original music over the weekend as well. On the Friday the music kicks off at 4pm with the blues/rock sounds of the Bombardiers (loved the bands set last year) and other acts on the opening day include colourful glam/punk rockers Dead Frequency, impressive indie outfit The Rushmore and a headline set by one of the areas top 1960/70’s rock/pop covers bands The Firm whose line up includes members from the famous Leamington Spa hard rock outfit Chevy. It all gets going nice and early on the Saturday with young metal band Zinc Zebra due on stage at 11.45 am and for me highlights for the rest of the day should include talented 14 year old singer/songwriter Matilda Pratt (also impressive at last years festival), what could be a real surprise package with the multi-genre Chaos, legendary local punk rockers The Jelly Heads and to close the festival top Rolling Stones tribute band The Rolling Stones Now. The acoustic stage will also make a return this year and as always there will be plenty to look at and do around the site while the catering and bar facilities provided are always top quality and value for money. My images with this piece are some of my newly sorted favourites from last years event.